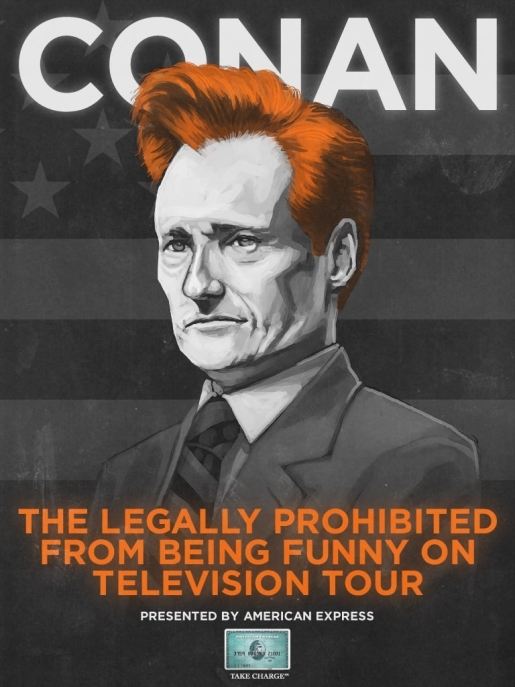 Comedian and writer Conan O’Brien, the former host of Late Night and The Tonight Show, has succumbed to his bored state as a newly unemployed person contractually banned from being on television. So, to cash in on his good will and to get out of the house (and his wife’s hair), Coco has decided to take his show on the road, literally! Conan, the band, and all the rest of his crew are undertaking a fairly ambitious 30-city barnstorming tour. It’ll have comedy, music, special guests, hugging, and even the occasional awkward silence! Here’s a few details about Team Coco’s Road Show. The cities and show dates are on the Team Coco website. Unfortunately, he’s not going to be anywhere within a reasonable drive of me. Well, Atlanta or Chicago, but that’s about it. However, he is going to play in New York’s Radio City Music Hall and Los Angeles’ Gibson Amphitheater. It’s not too often you get to go back to the place where you worked for so long and show them you haven’t been broken by their poor treatment of you.